This article will change your life as a business person. It’s a radical departure from the “conventional wisdom” of advertising and promotion, but like many great movements, its strength lies its simplicity and focus on core values. Customer Evangelism is the pure essence of marketing again. Remember, the definition of marketing that that we read in the first week of marketing 101? Something to the effect that marketing is defined as discovering and meeting the needs of your customers? It seems to have been promptly forgotten or defiled by many executives, product managers, and advertising firms upon graduation from business school. Customer Evangelism is a popular uprising that has the potential to bring marketing back to reality. “The Customer Evangelism Manifesto” by Ben McConnell and Jackie Huba takes us to the core essence of marketing and beyond. It’s about providing the highest quality solution and then providing even more to a special class of customer: the encouragement and empowerment to become an active advocate, or evangelist, and a de facto member of your organization. It’s a charter to breed a special kind of super customer who not only purchases from you regularly, but feels compelled to tell others. They passionately recommend your company to friends, neighbors and colleagues. They believe in the company and its people. They purchase your product as gifts. They provide unsolicited praise and suggestions. They forgive occasional dips in performance or quality. They do not want to be bought; they extol your virtues freely. They feel part of something bigger than themselves. This presentation from Colin Robertson at TED is one of the best demonstrations of concise and effective communication that I’ve ever seen. It has great object lessons that can be applied to Web design and marketing communication in general. He uses very few words, but the words he does use are the key messages of his presentation. So much of Web and print design would be much more effective with fewer but better chosen words. It’s out of the ordinary (way out of the ordinary) and creates a unique memorable experience. How long will you remember this presentation? How long would you have remembered it if he would of taken up the three minutes talking? The nonverbal communication which comprised 99% of the message is “quality” in the sense that it’s professionally orchestrated. The effect would not of been nearly as powerful or long lasting if that level of effort wasn’t put into the production. It’s the cumulative effect of many small details being done correctly. Same applies to Web design, overall quality is achieved by paying attention to many details which result in the cumulative effect of providing credibility to the message. I think this is a very important point–a significant portion of the content was provided with collaboration from the audience. We’ll give some insight here into installing a custom HTML signature in Outlook 2007 (PC/Windows), Outlook 2010 (PC/Windows) and Outlook 2011 (Mac/OS X). For some reason, Microsoft decided to remove advanced email signature editing functionality that were available with Outlook 2003 which made installing a custom HTML email signature a breeze. Although nowhere in the email signature feature of Outlook 2007, Outlook 2010 and Outlook 2011 is HTML mentioned, the signature is still in HTML format, it just takes a less direct approach to get it accomplished. To setup a custom email signature, you’ll need the design first coded in HTML and ideally posted on a public Web server. If you need our services to create the HTML email please contact us for more information. 1. Open the HTML file / URL that contains your signature in a Web browser such as FireFox. 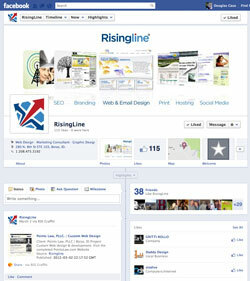 (For Risingline Clients, we would of emailed you this info already). 2. Left click at the top left of the page, then while holding down the shift key left click in the lower right area of the page. If you don’t see anything obviously highlighted you may need to left click at the top then hold down your left mouse button as you move to the lower right. 3. Right Click and select copy. 4. Create a new signature in Outlook 2007, 2010, or 2011 and then within that blank signature window right click and select paste or press ctrl-v.
5. Save your new signature and set your desired parameters. For more insight into working with custom signatures in Outlook feel free to check out these additional resources.